Steam locomotive, ‘Pet’, 0-4-0ST, 18" gauge works locomotive, London & North Western Railway, built at Crewe Railway Works in 1865, withdrawn in 1929. 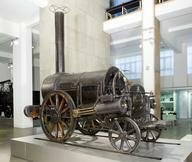 Pet was built in 1865 and spent its 64-year working life serving the London & North Western Railway’s Crewe Works. Running on the works 18inch-gauge railway system, Pet’s job was to move railway parts around the maze of foundries, boiler shops and wheeling sheds that made up Crewe Works. Its small size meant it could work almost anywhere within the site. Pet’s working life ended in 1929 and it lay forgotten in Crewe Works. In 1965 Pet was donated to the National Railway Collection and through the efforts of the Narrow Gauge Railway Museum at Towyn, restored to its current condition. 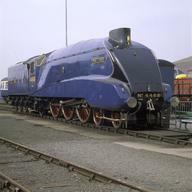 Pet returned to the National Railway Museum in 1995.